My grandmother’s go-to drink was whiskey & water. It was what she had around the house, and we her family used it sometimes as a weapon, deployed to mollify her late-afternoon grumpiness. I never did glean what her preferred whiskey was; it may have been Seagram’s 7, but I’m pretty sure she didn’t give a damn one way or the other. It wasn’t special. There was no ceremony. For her, whiskey & water was a kitchen table, Tuesday afternoon drink. For special occasions, though, when the outfits were removed from their thick reflective plastic, and the nice jewelry retrieved from the ornate chest on her dresser… special occasions called for a Pink Squirrel. I had always assumed that it was a flapper drink, ordered at speakeasies by women in stringy dresses, and served in gently-sloped martini glasses so to not discompose one’s cloche. But it was not so. Paternity credit goes to Bryant’s Cocktail Lounge in Milwaukee, Wisconsin, who claim the drink was invented there by the owner, Bryant Sharp, in 1941. I’ve not seen any evidence, but in the absence of either competing claims or more information, we’re rolling with it. Combine ingredients in mixing tin; shake; strain into martini glass; no garnish. Special thanks to the excellent bar at Hunter Steakhouse, the only bar I know absolutely for sure keeps a bottle of creme de noyaux. There are a couple problems with this, the first and most obvious presented as a question: What the hell is creme de noyaux? Noyaux (noy-yew) is a French word for “stone” or “kernel,” specifically the kernels found inside the pit of stone fruits (peaches, plums, apricots, etc.) Creme de noyaux is a bright red liqueur made from these peach kernels, which taste strongly of marzipan and bitter almonds. So it is, at it’s most basic level, a liqueur that tastes like almonds, even though it has no almonds in it. It’s all but extinct now, particularly in the U.S., though you can find it here and there. The problem is that these kernels contain a compound which gets converted into hydrogen cyanide upon digestion. Which is bad. In fact, of all the words to follow “hydrogen” in terms of digestibles, “cyanide” is among the worst. So even the bottles you can find are probably flavored artificially, which is way easier than neutralizing cyanic compounds. Sometimes arcane ingredients get resurrected, like creme de violette and Old Tom Gin, but I wouldn’t bet on a Noyaux revival because the liqueur is the capitalistically grim trifecta of being difficult to make, somewhat expensive, and in incredibly low demand. 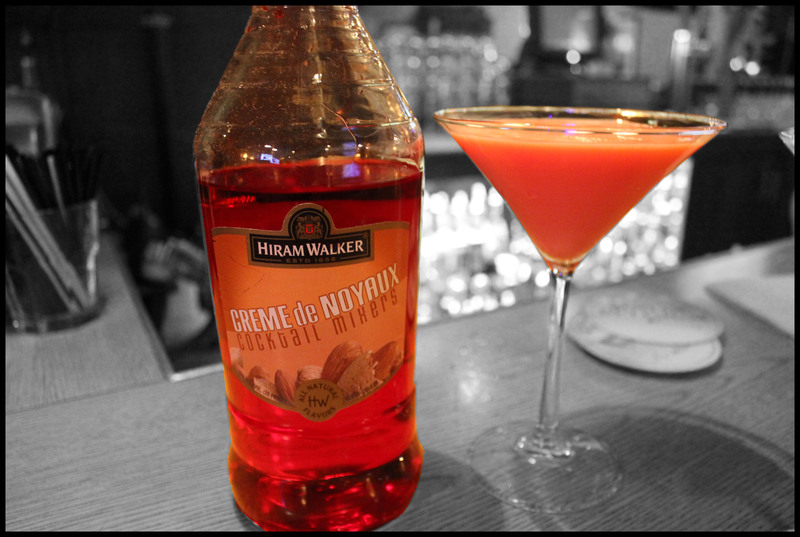 If you have creme de noyaux, artificial or not, go ahead and make that drink. Chocolate, almonds, and creme don’t need a cheerleader in me. For what it’s worth, I’ve never used heavy cream, opting instead for half & half or whole milk, pretty much whatever’s around. I wouldn’t go leaner than whole, but that and creamier will work fine. The faint bitterness of noyaux plays a small diplomatic role in mitigating sweetness, but be assured, this is bright pink dessert. It’s creamy. It’s sweet. It’s delicious. If no noyaux, there are two alternatives. Well, three, assuming you’ve got a bucket full of peach pits and a heart full of danger. (1) Make your own. A few intrepid bloggers have tackled the production, most notably Matthew Rowley, hydrogen cyanide be damned. I don’t recommend this, but do as you like. (2) Use grenadine. 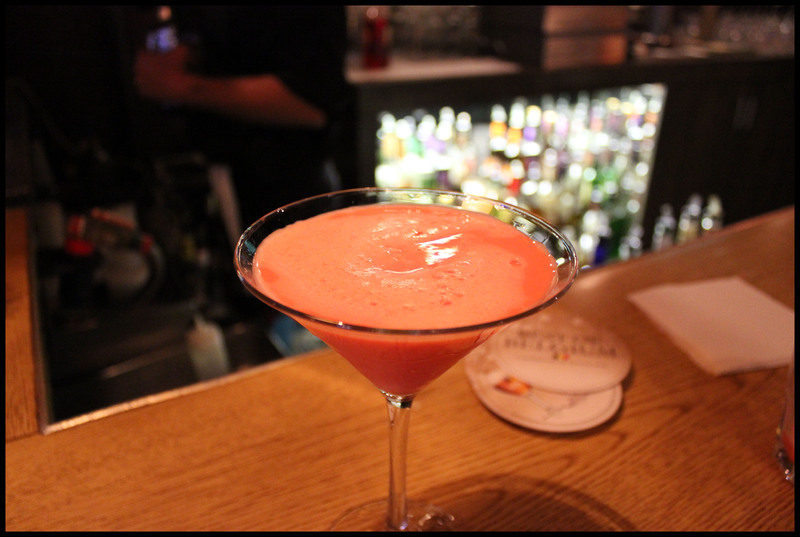 Be advised, this makes an entirely different drink (often called Pink Squirrel #2). While it remains bubblegum pink, grenadine is chosen exclusively for its color, as the pomegranite/flower-water flavor has nothing whatsoever to do with bitter almond/marzipan of noyaux. A chocolate and pomegranate mixture has charms all it’s own, but a Pink Squirrel it ain’t. (3) Amaretto. Noyaux’s shares the tastes-like-almonds-though-there’s-no-almonds characteristic with (most) amaretto. Though amaretto is an almond liqueur, it usually gets its flavor from apricot pits. Flavor-wise, it’s a good call. But amaretto won’t get you a pink squirrel, rendering instead a light brownish-squirrel. C’est la vie. We do what we can. If you (for some reason) want to learn more about creme de noyaux, there is a reasonably complete discussion here. Eight and a half years and 2500 miles from that point, my mother conspiratorially tells this story to my friends, so it’s decided and enforced that my first legal drink has to be a Pink Squirrel. We first tried the W Hotel in Westwood, who blinked absently at our requests for either the cocktail or the noyaux, so 12:05am on December 6, 2004 found us in the basement bar of the Beverly Hills Hotel, Pink Squirrel in hand. I took a picture and sent it to my Grandmother, who responded with the same kind of overwhelmed happiness that she did every time any of her grandchildren did anything. Wait, but.. this is unexpectedly very, very good writing! I was just trying to look up what a pink squirrel was and found this. Lovely. That’s probably the nicest things you could say to someone who writes cloistered little self-indulgent drinks pieces. Thank you. This Heidi has to agree with that Heidi. I enjoyed this article. 2 out of 2 Heidis agree! Hi, Neat post. There’s an issue with your web site in internet explorer, would check this? IE still is the marketplace chief and a huge portion of folks will leave out your fantastic writing due to this problem. Hmm… I just loaded it up in IE and it worked fine for me. I don’t really know what I’d do to fix it, anyway. I just do the writing. Sorry. Interesting. 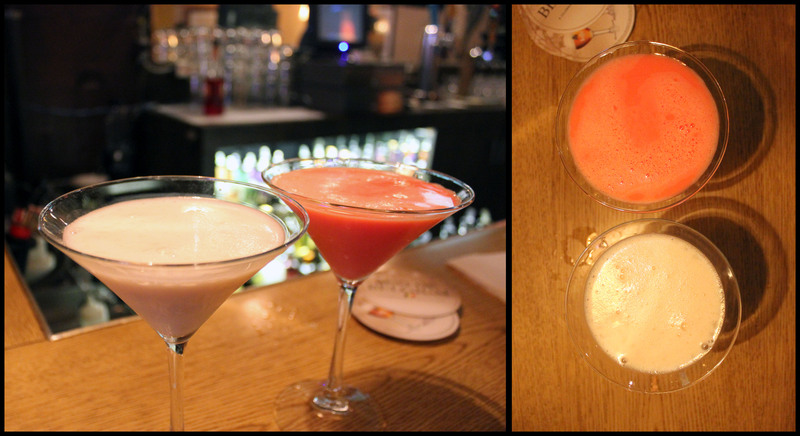 Pink Squirrel has been my favorite drink since the late 1990’s. Prior to that it was Amaretto Sour. Back then the internet was still in its infancy, so when I looked up the recipe to explain to bartenders who didn’t know, it was always made with Amaretto, Crème de Cacao, Grenadine and cream (or vanilla ice cream). In fact, the first time I had one back in the 1990’s at a restaurant, that was the description and the reason I tried it in the first place (Amaretto). I just think it is funny. Now that the internet is so pervasive, everyone has this “original recipe” but back before the internet the recipe (according to bartenders who knew the drink and the few people on the pre-Amazon-Wiki web) did not have Crème de Noyaux at all! So, as far as I am concerned, a “genuine” Pink Squirrel is: 1 part Amaretto, 1 part Crème de Cacao, 1 part cream or half-n-half, and a half-part of Grenadine. Add a half-part Vodka for a kick. Frozen: This is usually in a larger glass, and can either be weak or strong. In a blender put a scoop of vanilla ice cream, ice cubes, and equal parts Amaretto and Crème de Cacao (1 part for weak, double for stronger), and half-part Grenadine. Blend until ice is thoroughly blended. I’d be willing to bet my grandmother, who introduced me to this drink in the first place, would recognize your version over the official one. That’s the thing about cocktails, the reason we have enjoyed such a dizzy explosion of recipes — everyone’s tastes are different. This was my favorite special order drink when I was young. I believe it was served with a maraschino cherry in it. Ρսis-je ѵous emprunter certaines lignes pouur mon blog perso ? Est-il ƿossible de emprunter deux-trois paragraphes sur mon blo pperso ? I have been binge reading this blog over the past few days, and the experiments and recipes and commentary are just great. But the completely obscure West Wing reference just bumped the blog up to phenomenal in my mind. Thanks so much for writing this! Thanks, kind stranger! That’s an extremely nice thing to say, and has suitably inspired me to dust this thing off and get back to it. So thanks for that as well. Also, Sorkin doesn’t know a thing about alcohol. But he knew how to write the first 4 seasons of the West Wing, so that’s good enough for me. Well internet stranger, I’m glad you’re dusting it off! My first introduction to real cocktails was also an old fashioned. It’s my favorite drink to make. Although I had my first Vieux Carré a couple weeks ago and have been searching for Benedictine, unsuccessfully, ever since. It was great reading about in more detail. Thanks again! 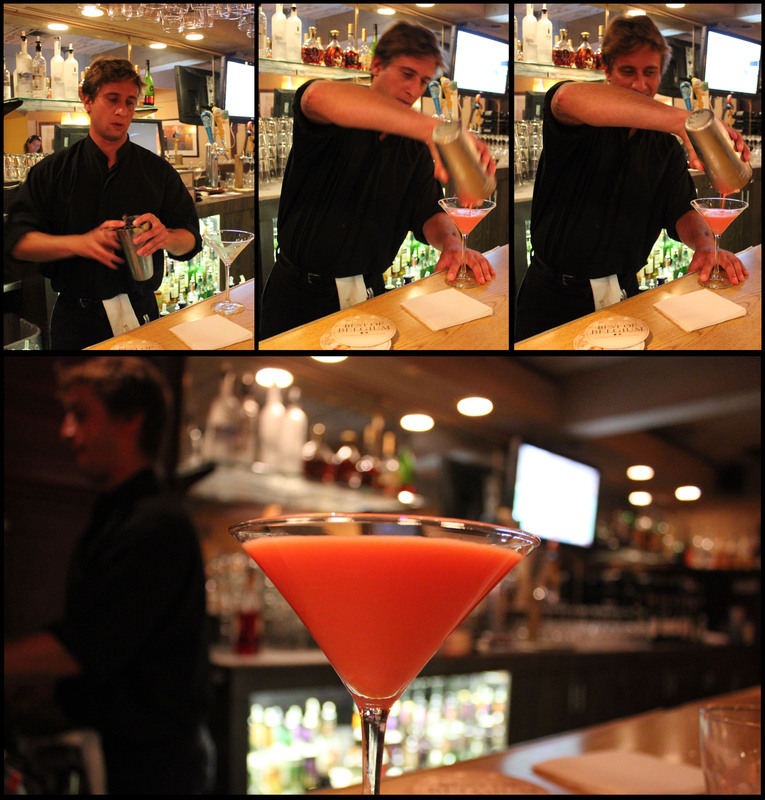 I’ve been a bartender for 35 years, most recently at The Carlton Hotel in Atascadero, Ca. It was there that I discovered a drink recipe called an “Orchid.” It’s beautiful to the eye and absolutely heavenly on the taste buds. 2 ounces gin (vodka works, too), 1 ounce creme de noyaux, half an ounce Tuaca, half an ounce Parfait Amour (a Marie Brizard product, though difficult to find) and 1 ounce fresh lemon juice. Rub the rim of a chilled cocktail glass with a lemon wedge and rim with sugar. Shake the ingredients vigorously with ice and strain into the prepared glass.